“According to Hindu mythology this sacred tree symbolizes Lord Siva”. Unripe fruit of this tree is very good for digestive problems. When the fruit is half ripe (green) the pulp is taken and dried in Sun. This is then powdered and preserved 3 to 10 grams can be taken twice or thrice a day to cure diarrhoea, dysentry and worm infestation. It is also a very good source of vitamin C and treats scurvy. Ripe fruits is nutritious and laxative. The pulp of ripe fruits can be seived well and seeds are removed. It is a very good for toning the Intestine and cures constipation. In North India, Sharbat or drink is prepared from the seived pulp of Vilvam, milk and sugar. It is a very good drink perticularly in Summer season. 1. 20 g of paste of the leaf taken orally, followed by bath in cold water, will stop excessive menstrual flow. 2. Parched tender leaves, given as fomentation, will cure soreness, pain, reddishness and irritation of the eye. 3. Crush and boil 20 g of tender leaf of vilvam, dried ginger, pepper and cumin seed in 1 litre water and reduce to 100 ml. Its consumption will cure any kind of fever. 4. Half teaspoon of dried leaf, pounded and powdered, taken in half a teaspoon of honey in the form of a paste in the morning and evening will clear hoarse voice, headache, persistent pain in the head, cough and cold, asthma and dropsy. Siddha Medicine, Vilvam tablet is good to treat Hyperglycemia. Oil prepared from Vilvam leaves, gingelly oil and pepper is good bath oil if massaged regularly over the vertex before bath helpfull to treat Kapha problems. 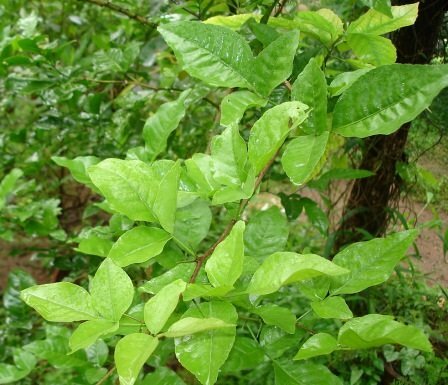 Oil prepared from leaves and gingelly oil can be used as Ear drops for Ear problems. 5. Half a teaspoonful of dried leaf, mixed in ghee, consumed in the morning and evening, will provide relief from irritation of stomach, excessive acid secretion, stomachache, gastric ulcer, constipation, loss of appetite, irritation in the urinary tract, leucorrhoea and gonorrhoea. 6. One teaspoonful of powder of the leaf mixed with one teaspoonful of karisalankanni, taken daily, will cure jaundice quickly. 7. The tender fruits (10 g) ground in curd and given daily will cure dysentery and ulcer in children. 8. 1 g of powder of dried pulp of the fruit, mixed with a little sugar, and taken three times a day will cure dysentery, diarrhoes and loss of appetite. 9. Ripe fruit, mashed with water, filtered through cheese cloth, mixed with sugar, boiled to honey-like consistency and taken at a daily dose of 30 ml, will cure vomiting due to excess acid secretion, irritation in the respiratory tract, piles, chronic diarrhoea and dysentery. 10. 10 g of green bark of root ground with 1 g of cumin seed, mixed with milk and filtered through cheese cloth, taken in the morning will be an excellent energizer and a general health tonic. Decoction of Vilvam leaves is good for peptic ulcer. Leaf juice 10 to 15 ml can given daily for treating Diabetes. Leaves can be soaked over night in water then ground well next morning and given with the remaining water to Diabetes patients. Powder of leaves and Turmeric powder can be given in the dose of half teaspoon twice or thrice a day to treat Megha neer katti, Diabetic ulcers etc. Vilvam powder is available at IKS Academy Centre in Kuala Lumpur, Malaysia.